Vain Victory: the Vicissitudes of the Damned was an Off-Off-Broadway musical written during 1969 - 1971 by Jackie Curtis who also appeared in "Andy Warhol's Flesh" and "Andy Warhol's Women in Revolt" - both directed by Paul Morrissey. 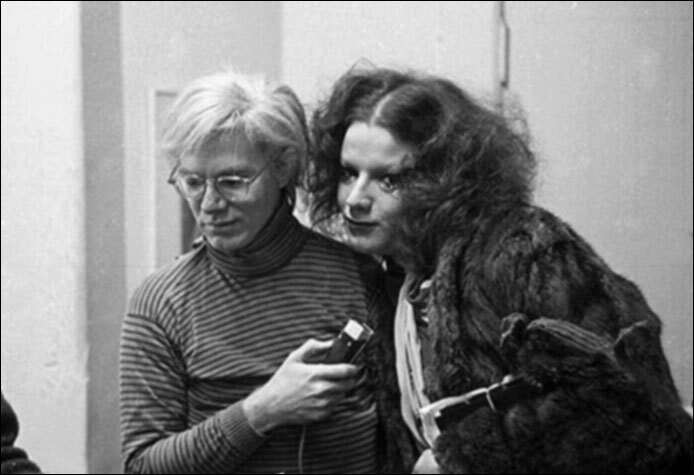 (Jackie claimed that Warhol, rather than Paul Morrissey, filmed his scenes in Women in Revolt but that was contradicted by Holly Woodlawn in her autobiography, A Low Life in High Heels: The Holly Woodlawn Story - see "Women in Revolt.") Jackie was not part of Warhol's original silver Factory which gave rise to superstars like Edie Sedgwick, Nico and Mary Woronov. She appeared in her first film, Flesh, after Warhol had already moved his operations from the silver Factory to offices at 33 Union Square West in 1968. The first ad for Vain Victory appeared in the Village Voice appeared in the January 28, 1971 issue, even though the production was not scheduled to open until May 26. By May 1971, when the play opened at La MaMa, Jackie had recently finished filming Women in Revolt (see "Women in Revolt"), although it would not open in New York until February of 1972. Flesh, which featured Jackie Curtis and Candy Darling in small roles, opened in September 1968. Audiences would have been familiar with Jackie from his small scene in Flesh or from his previous work on Off-Off-Broadway - or they would have known him personally from New York night-life. 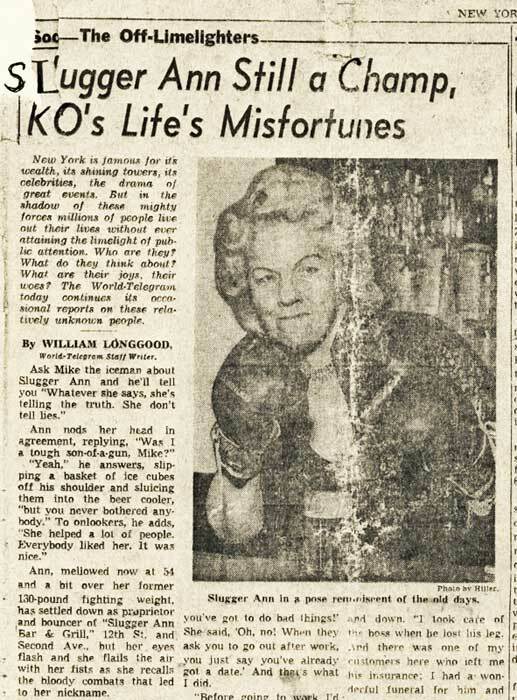 Jackie was mostly raised by his grandmother, Ann Uglialoro, who was also the owner of the Lower East Side bar, Slugger Ann - which was Uglialoro's nickname. The La MaMa program gave the the credits of the production which differed from the original ad. 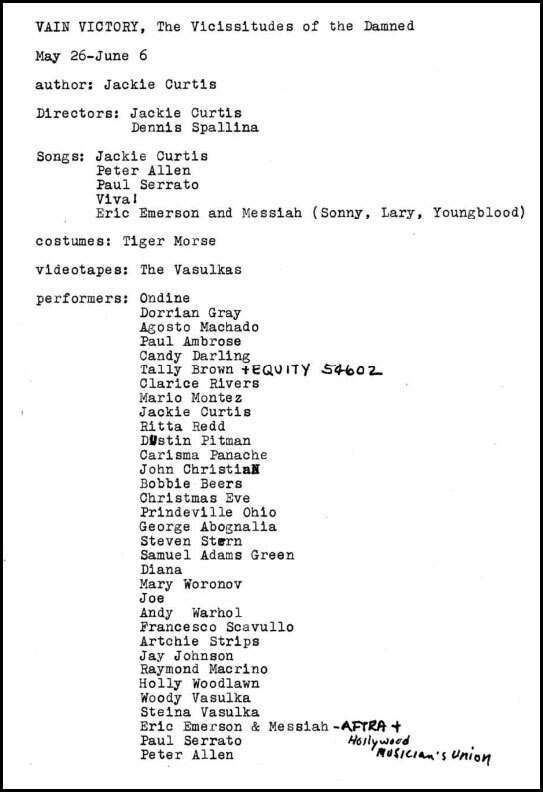 Additions to the Vain Victory cast were: Agusto Machado, Candy Darling, Mario Montez, Dustin Pittman, Carisma Panache, John Christian, Bobbie Beers, Christmas Eve, George Abagnalo, Steven Stern, Samuel Adams Green, Diana, Mary Woronov, Joe, Andy Warhol, Francesco Scavullo, Raymond Macrino, Holly Woodlawn, Woody Vasulka, Steina Vasulka, Eric Emerson and Messiah, Paul Serrato and Peter Allen. The script and the cast would change over time. Some of the people listed such as Andy Warhol) were not in any of the productions. 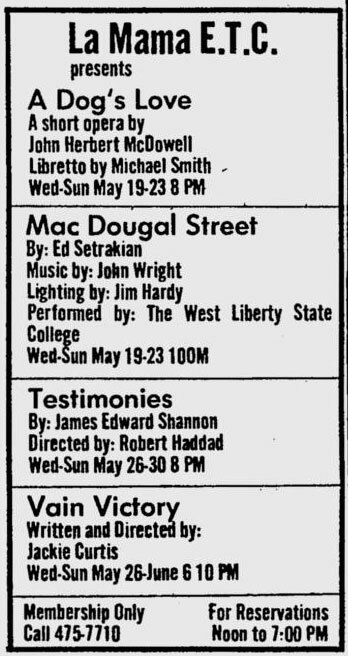 Although Vain Victory was not "held over" at La MaMa as some accounts suggest, it opened about two months after closing at La Mama at a different venue, the WPA at 333 Bowery, on August 11, 1971. The run of the play at the WPA was well advertised. 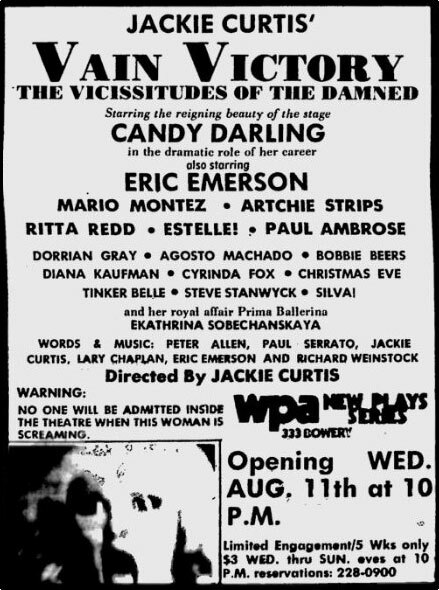 A large ad in the July 29, 1971 Village Voice announced that it was opening on August 11th as part of the WPA's "New Play Series." Additional ads in the form of a comic strip titled "Artchie Strips" true Adventures also appeared in the Voice. ABAGNALO: Are you fond of Puerto Ricans now? WOODLAWN: Oh, I love Puerto Rico! I adore it! WOODLAWN: Puerto Ricans! Of course. I know my people. I have this whole Puerto Rican mad woman in my act called Chi Chi. The Village Voice did not review the La MaMa production of Vain Victory but they did review the WPA production. The reviewer criticized the play for not only "lacking in wit" but also for lacking in "grace, charm, intelligence, narrative value, pacing, and theatrical flair."